Freshman Margaux Thompson registered a career high 18 kills to help propel the Youngstown State volleyball team to a five-set victory against Saint Francis U in match two of the Courtyard Marriott-Canfield Penguin Invitational. The set scores were 22-25, 25-15, 21-25, 25-18, 15-12. Youngstown State also got double digit kills from junior Sarah Varcolla, as she registered 13 with a .270 attack percentage. Senior Sam Brown also chipped in with nine kills, and Morgan Tippie and Marketa Plesingrova had eight each. Thompson added 24 digs to notch a double-double, and Lauren Blanco posted a 25 digs. Saint Francis had two players who registered over 20 kills each with Kelsey Roush leading the way with 25 kills. Emily Marcinowski was behind her with 23 kills. As a team, the Red Flash had 5 service aces with 6 service errors. Libero Jenna Veres had 36 digs. A back-and-forth match saw Saint Francis take the first set by a score of 25-22 with only one lead change. The second set was all YSU as the Penguins won 25-15 leading the entire set. After intermission, the third set saw eight lead changes but a late push by Saint Francis gave it the 25-21 advantage. YSU would not go away though as it took charge in the fourth set with a score of 25-18. The fifth set would belong to the Penguins and Thompson individually. The freshman registered three kills in the fifth set to give YSU its second home win of the season. 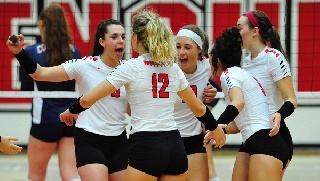 Youngstown State ended a five-match losing streak and improved its record to 5-5. The Penguins will close out the Courtyard Marriott-Canfield Penguin Invitational tomorrow at 11 a.m. against state-foe Akron at 11 a.m.